The Maine SBDC has received funds from the U.S. Small Business Administration (SBA)’s Portable Assistance Grant Program to develop a program that will provide entrepreneurial advising and training for potential and existing business owners in the Bucksport Bay Area who have been adversely affected by the closure of the Verso Paper Mill. Are you thinking about starting a small business? Or do you already own one? There’s a free small business resource program for the Bucksport Area ready to help you with everything from starting, to maintaining and growing your small business. The business advising is confidential, offered at no charge and provided by Maine SBDC business advisor Betty Egner. For more information or an appointment please call Betty at 207-664-2990 or email: betty.egner@ceimaine.org. 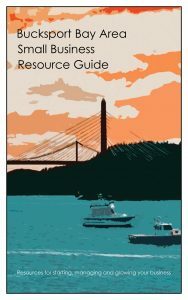 The Bucksport Bay Area Small Business Resource Guide has been created exclusively for the Bucksport Bay area and will put you in touch with the people and programs that will advise mentor, educate, inform and assist you with all your small business needs. Click here to access it online or click here to download a PDF. The Maine Small Business Development Centers (Maine SBDC) hosted a free small business breakfast and resource fair for entrepreneurs and small businesses on June 15, 2016 from 9-11:30 a.m. at the Alamoosook Lakeside Inn in Orland. The event featured a buffet breakfast and guest speaker Bob Crowley, small business owner and winner of the reality show Survivor: Gabon. Crowley entertained attendees with stories of his time on Survivor and about his post-show recreational small business, Maine Forest Yurts in Durham. In addition, entrepreneurs and small businesses had the opportunity to connect with representatives from small business resource organizations that were on hand to share what they do and how they can help area businesses. Organizations included the U.S. Small Business Administration, the Maine State Department of Economic and Community Development, Eastern Maine Development Corporation, New Ventures Maine, The Bucksport Bay Area Chamber of Commerce and Downeast Maine SCORE. This event was put on as part of a grant-funded initiative through the U.S. Small Business Administration (SBA). The program provides entrepreneurial advising and training for potential and existing business owners in the Bucksport Bay area who may have been adversely affected by the closure of the Verso Paper Mill. The Maine Small Business Development Centers (Maine SBDC) has received funds from the U.S. Small Business Administration (SBA)’s Portable Assistance Grant Program to develop a program that will provide entrepreneurial advising and training for potential and existing business owners in the Bucksport Bay Area who have been adversely affected by the closure of the Verso Paper Mill. The program will be a collaborative effort of the Maine SBDC in association with CEI, New Ventures Maine and other local economic development organizations. This program will be designed to equip entrepreneurs and anyone interested in starting a business with a broad range of knowledge necessary for successfully developing and growing a small business. The grant will provide essential entrepreneurial training to help current businesses and those who may be interested in starting a business explore the opportunities in the area. Maine SBDC will staff a business advising outreach office, located at Bangor Savings Bank in Bucksport, where a certified business advisor will be available to meet with new and existing businesses to discuss challenges and opportunities confidentially and at no cost. “This grant will provide targeted critical resources to enable us to enhance services to this struggling area,” explains Mark Delisle, Maine SBDC State Director. Beyond business advising, Maine SBDC plans to organize an entrepreneurial tourism-focused workshop series, provide ‘mini-grants’ to select small business clients for professional services, host a small business resource breakfast and put together a business plan competition. These activities will be paired with online content that will be available to business owners.